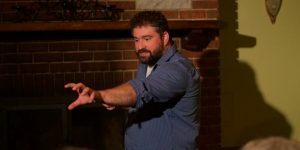 This Much Is True is one of the longest running storytelling shows in Chicago, IL. 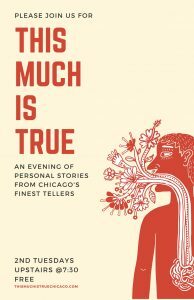 Every month, we come together in the cozy upstairs lounge of one of the city’s finest pubs for an evening of true personal stories from some of Chicago’s most fascinating people. An all new cast takes the stage each month to let you in on the heartbreaking, the hilarious, and everything in between. TMIT is intimate. You’ll feel like you have joined friends to share life experiences over a few pints. 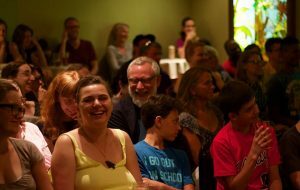 Past guests have included writers, actors, chefs, theologians, SNL alums, musicians, bloggers, activists, professional storytellers, comedians, and more from our city and around the world.